SBM portable impact crusher station mounted on heavy duty chassis for quarry applications for primary, secondary, or tertiary crushing. Integrated with feeder, conveyor, impact crusher, screen, the entire process is guaranteed from the feed to the discharge end. From developing initial process flow sheets and plant layouts to furnishing complete systems, SBM crusher is ready to help regardless of project size. Putting crushing and screening process on wheels really boosts process efficiency. Mobile impact crusher offers maximum set-up flexibility, from coarse to fine crushing, and is cost efficient. It improves working safety, reduces the need for quarry road maintenance, and gives better access to material resources. A further benefit is that waste material can be separated on-site. 3) Stand alone use or as a part of multi stage processes. Mobile impact crusher can be arranged as a two-stage crushing and screening system, as a three-stage coarse, secondary and tertiary crushing and screening system, or as three independent units. AKROLITHOS S.A. was founded to mine slates from region Pageo - Kavalas in Greece. The Company was expanded at the process of these slates and other natural stones from various parts of Greece. The portable impact crusher supplied by SBM in the processing unit at Mandra Xanthi in Greece which produces and processes a sandstone material called "stone Mandras", the final products is widely used in aggregate industry. 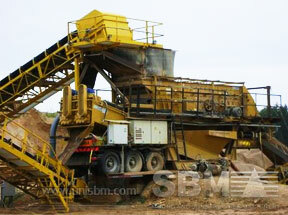 "SBM portable impact crusher help us resolve a lot of problems in the mining and quarrying operator." BMS is a group of Factories specialized in Mining, Processing and Treating Industrial Minerals such as silica sand, Quartz Gravel, Natural gravel, limestone, crushed marble chips and calcium carbonate. BMS mines of quartz and silica Sand is one of the few locations in the country located in central and Northwestern regions of Saudi Arabia. 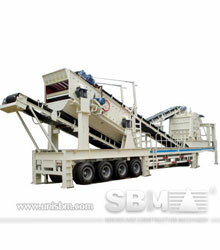 The portable impact crusher manufactured by SBM Machinery is widely used to process the silica sand in the quarry. "In our country, portable impact crusher is suitable for us in the quarrying deposits in stone desert"